Stung Treng, Cambodia, September 2017: At a primary school located in a village in the remote northern province of Stung Treng, a group of Grade 1 students recites poems about morality and ethics. It’s part of their daily routine at Sre Krasaing Primary School, where the student body numbers 290 children, including 138 girls. Chanle Hua, a shy eight year old, reads a piece about respecting elders and keeping the surroundings clean. His school exudes a welcoming appearance, with rows of small plants potted in recycled bottles and flyers, charts and drawings made by students covering the building’s walls. Located in a forested area 40 kilometers from the provincial capital, the remote school is two kilometers from Chanle’s simple home. He must walk along an isolated, narrow, dusty path to get there. Chanle’s situation isn’t uncommon in Cambodia: Based on a UNICEF analysis of the 2012 Cambodia Socio-Economic Survey, an estimated 13 per cent of primary school-aged children are not in school. This figure is as high as 20 per cent in rural areas like Chanle’s. 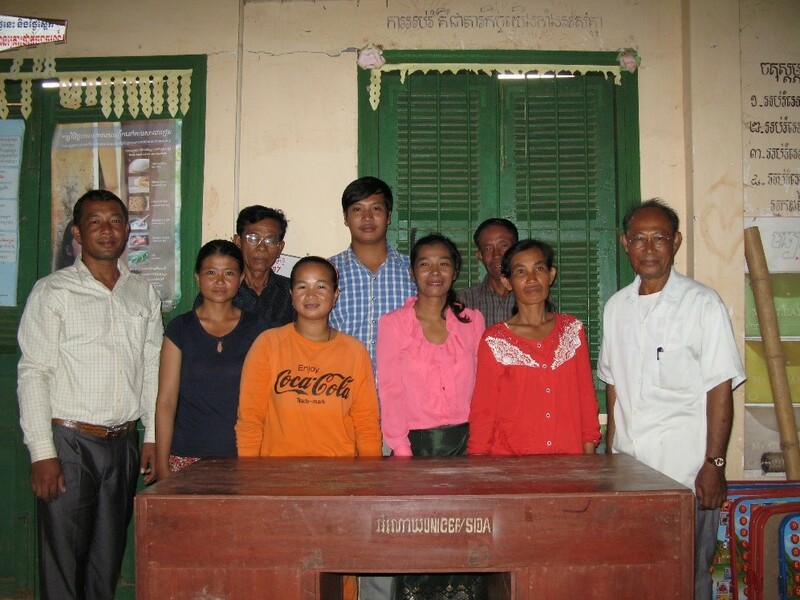 Commune Chief Ya Bunsun is well aware of the barriers to education faced by the children in his community. “Poverty, lack of transportation, and cultural beliefs prevent children from coming to a school,” he describes. 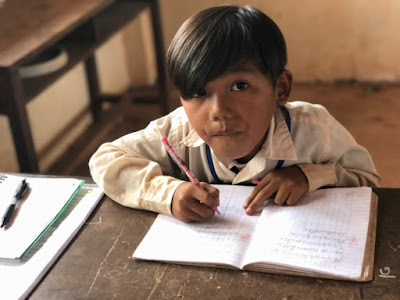 But with the help of improved monitoring and data collection, effective advocacy, and enrolment drives, Sre Krasaing Primary School is seeing the situation ease and the return of children like Chanle to the classroom. Walking through the school’s corridors, School Director Kim Saroeun, discusses the situation at her school. “Though the number of children in school is increasing each year, our aim is to reduce the number of out-of-school children in the surrounding villages.” She estimates that the number of out-of-school children has dropped to just 10 per cent. Absenteeism is also very low and the current drop-out rate is zero. A key component to this change has been the effective use of the Education Management Information System (EMIS). Managed by the Ministry of Education, Youth and Sport (MoEYS), EMIS was developed to collect reliable and comprehensive data on various education indicators that inform education policy development and implementation in Cambodia. This system has been strongly supported by the Capacity Development Partnership Fund (CDPF), a partnership between MoEYS, the European Union, the Swedish International Development Cooperation Agenda (Sida) and UNICEF that began in 2011 in collaboration with non-governmental organizations such as Volunteer Service Overseas (VSO) and Care International. A multi-donor trust fund underpins this partnership, as well as strong commitment to joint work planning to address education sector priorities. This CDPF funding is enabling local and national MoEYS staff and school management personnel to receive proper EMIS training. Following the training, which has to date been delivered to over 1,526 staff, education personnel are able to accurately enter education data, analyze it and capture information on critical indicators relating to education access, equity and the availability of infrastructure facilities. With this info, school staff are also able to identify children in the community who are not attending school. She further reiterates EMIS’ significance in capturing data on out-of-school children. “The data analysis using EMIS helps us keep track of students in school as well as identifying those who should be. Since the information generated using these tools is reliable, we can use this data to formulate strategies with the commune chief and the School Support Committee to get more children to school and shape our annual school development plan,” she says. Chanle represents one such success story. 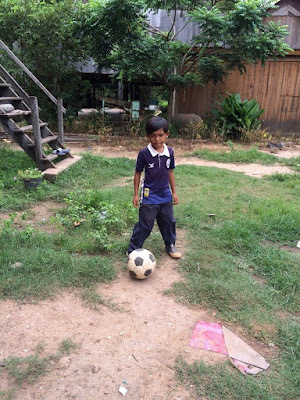 Once identified by the data, successful advocacy on the part of Sre Krasaing Primary School leadership – including direct engagement with Chanle’s parents to encourage the boy’s return to school – led to his re-enrolment eight months ago. Despite starting school late and being overage in Grade 1, Chanle happily admits that he likes coming to school. “I like school and I am also doing very well and receiving full marks in all my assignments. I got Rank 1, too!” Now, rather than face the long walk to school alone, his father has agreed to take him to school in the mornings and he has found friends to accompany him on the way home. After the school day is over and he finishes his homework, Chanle heads home. He follows the neglected, narrow path that once prevented him from the right to an education. His small house stands on stilts, alongside the Mekong River. With schools and communities like Sre Krasaing leading the way, Cambodia’s children have a better chance to join and stay in school, no matter how challenging the road that lies ahead.